Even though I’ve written tirelessly about this topic, there never seems to be a shortage of information that is important for people to hear yet is never presented in the mainstream. Our society has done a great job of ensuring people do not know the truth about alcohol or even want to hear it when they do. The information that I share is information that often comes as a shock to me, but also that I wish someone would have shared with me when I was still drinking. Of course, we know that alcohol is not good for you, but I think a lot of people don’t realize just how bad it is for them. There are no warning labels on alcohol bottles, for example, unless it’s about not drinking while pregnant. Another very interesting factor to consider in regards to alcohol consumption is how little its detrimental health effects seem to bother people, especially when compared to other, much safer mind-altering substances. Actually, let’s just call them what they are: drugs — alcohol included. Alcohol is a drug, believe it or not, but again, it’s not often perceived that way. Why is that? It is so socially accepted and pushed in our society and culture that people are often shocked if they hear someone say they don’t drink. With more and more awareness being raised about this important issue and a rise in health conscious consumers, people are beginning to take a look at their alcohol consumption and adjust accordingly. Finally it is becoming understood that alcohol is a carcinogen and should be treated as one. The study followed 550 men and women for 30 years, measuring their brain structure and function to determine how alcohol use affects the mind over time. What they found is that the more people drank, the more atrophy occurred in the brain’s hippocampus, a seahorse-shaped structure in your brain that plays a role in storing memories. The highest risk was for people who drank 17 standard drinks or more of alcohol per week. But even people who drank moderately saw an elevated risk for cognitive changes. The hippocampus is an important gland that plays a fairly large role in the regulation of the body’s limbic system and memory — hence why people who are intoxicated tend to have slurred speech, lethargic movement, poor memory, and even suffer from blackouts. 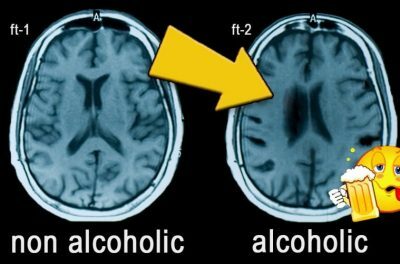 An important factor that this study points out is that regular drinkers may be experiencing continued atrophy of the hippocampus, meaning that as the years go by, the effects of alcohol use compound and can contribute to serious health issues as we age. The more research methods improve, the more we can learn about cognitive changes in the brain of people who consume alcohol on a regular basis, which might be more people than you would think. These developments are significant because of our cultural exaltation of alcohol as something that is virtually harmless in moderation and also the idea that moderate alcohol consumption actually provides a number of positive benefits. Why Is Alcohol So Pushed On Us as a Society? When you consider all the natural, safe alternate drugs that are still illegal, you might start to question why alcohol is not only legal, but readily available and essentially pushed onto us. When you consider the fact that chronically poor health is a model of business in today’s world and that medical establishments benefit financially from people whose health is continually declining, it’s easier to understand this level of corruption. But with awareness comes change, and by being aware of these types of things, we can make informed and educated decisions about what we want to contribute to and what we want for our own heath.